Up to 400 contractor jobs at the new Hinkley Point C power plant are at risk because finances for the nuclear build are still being worked out. Developers EDF Energy has announced it will not begin the next phase of work until it has made a final investment decision on the whole project. The firm said the jobs would not be axed as a consultation and a redeployment programme would be set up. Some 250 contractors who work alongside EDF staff will remain. Unions have said a 45-day consultation for redundancy has been launched. National officer for the GMB, Phil Whitehurst, said: "The problem seems to be the stalled final investment decision. "This is the second time this process has been initiated by EDF. Questions now need to be answered by the French government-owned company whether they will complete the new build. "This should now be a wake-up call for the next UK government to take charge and manage the failing energy policy we have in place." Another union, Unite, called for the final investment decision to be announced and for the government resolve the issues facing Hinkley Point as "a matter of urgency". There are currently 800 staff on site. For several months, preparation works have been taking place such as building earthworks, drainage works, concrete production facilities and culvert construction - where water channels are built to move water around the site - but now this is nearing completion. 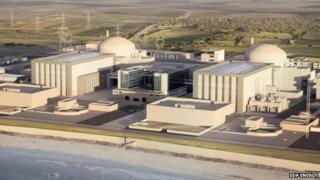 EDF said the second phase was being delayed as it would "require a substantial increase in spending levels". A spokesman added: "In the meantime, work to ensure the project's readiness will continue, including project planning, engineering design and commercial supply chain activities." Meanwhile, the company has said its talks with its investors are "making positive progress". In October 2013, chancellor George Osborne agreed talks could begin with two state-owned Chinese companies, China General Nuclear Corporation and China National Nuclear Corporation. If those talks are successful the Chinese investors could end up with a 30% stake in the nuclear build. Talks are also continuing with a third investor, Areva, which may secure up to 10% ownership. EDF has said it will also have up to 15% stake of the company open for interested investors.